Hip replacement surgery is also called a total hip arthroplasty. Included in the hip is a ball and socket joint, which is made of bone. In hip replacement surgery, the ball and socket joint is replaced with ball and joint components made of synthetic material. The ball joint is made of ceramic or metal, and the lining of the socket component is also made of ceramic or metal. Hip replacements are performed to relieve pain and to improve mobility and function of the hip. According to the Bulletin of the NYU Hospital for Joint Diseases, a femoral neck fracture can develop after hip replacement surgery, which can result in pain. A femoral neck fracture is a fracture in the bone, just below the newly implanted ball joint. Women are more likely to develop a femoral neck fracture, possibly due to lower bone densities than males. Also, obesity has been shown to correlate to an increased risk of developing a femoral neck fracture. The implanted components can loosen and become a source of pain. There is little concern that wear is a factor in the loosening of the components. The "Bulletin of the NYU Hospital for Joint Diseases" notes that unevenness of cement is more likely a factor. For whatever reason the components become loose, a loose implant can be a source of pain. 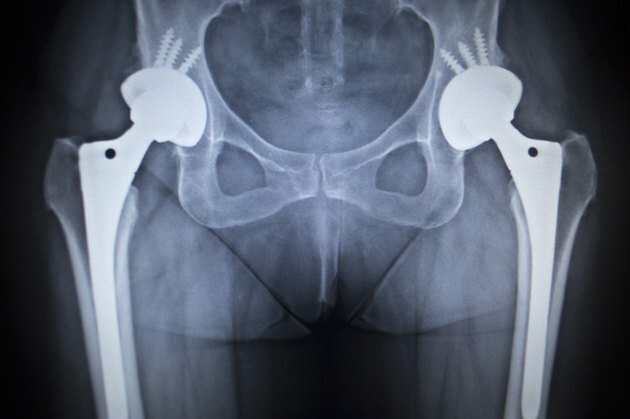 Hypersensitivity to the metal used in a hip replacement can result in pain. The pain can result from a number of different conditions that arise due to the hypersensitivity. These conditions include joint effusion, which is a build-up of fluid, and enlarged bursa, which are fluid-filled sacs that are normally present. Hip impingement can result in pain after hip replacement surgery. Hip impingement occurs when the normally smooth motion of the ball joint in the socket is interrupted, or the smoothness of the motion is impaired. There are a number of factors that can increase the risk of hip impingement. These include various deformities of the femoral neck.